“Hird” Sports Badge - Bronze, Silver, Gold. “Hird” Sports Badge - Bronze - Obverse. “Hird” Sports Badge - Bronze - Reverse. The badge comprises of a circular disk which is slightly convex. It has a diameter of 33 mm which has a raised edge line and an inner one producing 3 mm field. Onto this in raised capital letter round the upper position RIKSHIRDENS. Two pellets are place one either side. Beneath again in raised capital letter IDRETTSMERKE. The centre has a Nordic cross. The vertical leg has a raised 6 two leaved frond with a single leave at the top. Over this is a pair of crossed broad bladed double edged swords. The fields between the arms of the cross are in filled pillar box red opaque enamel. The reverse is plain with the indented mark of the crossed swords. 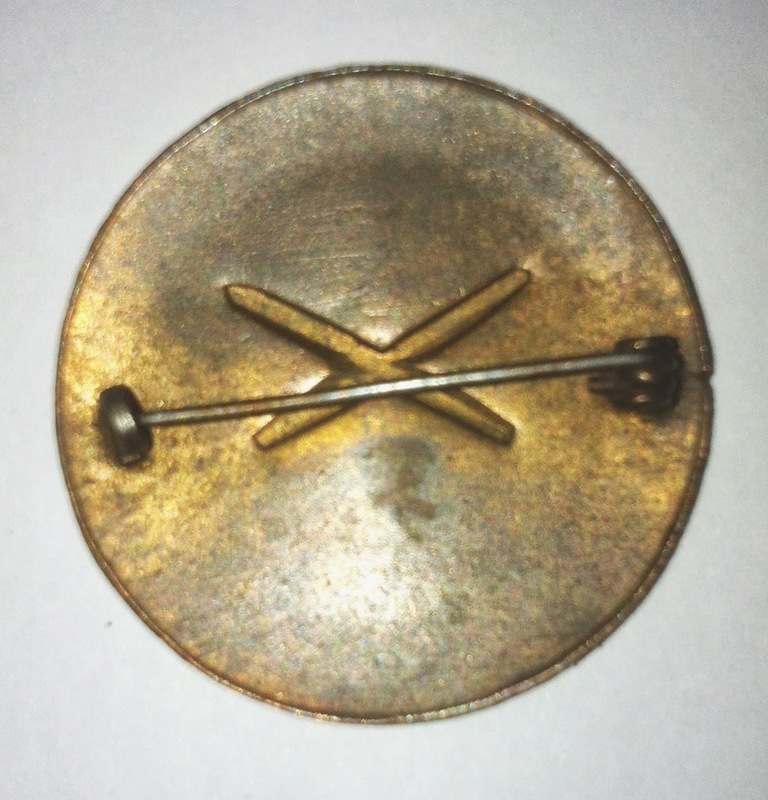 It has a horizontal hinge with thin wire pin secured by a wire “C” hook. There is another form of the badge, which has the fields between the arms of the cross fretted out. Axel Stang - Leader of the Norweian Hird. Above his left breat pocket he wears the NSUF Marksmanship Badge, the NS Badge of Honour, the Hird Sports Badge. In his tunic button hole is the ribbon of the German Iron Cross 2nd class. Axel Heiberg Stang - Leader of the Norwegian “Hird”. 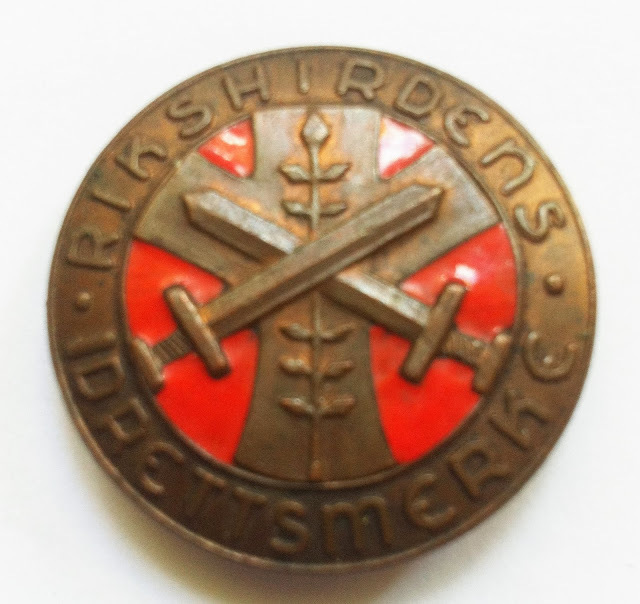 Iron Cross Second Class, NSUF Marksmanship Badge, NS Badge of Honour, “Hird” Sports Badge. Born into two of Norway's most politically influential and wealthy families with large estates. His father Ole A. Stang was a businessman and landowner, while his mother Emma Heiberg was Queen Maud’s most trusted confidante and Lady’s Maid. He was born in Kristiania and had a brother Thomas, who subsequently married the actress Wenche Foss. He was uncle to the current Mayor of Oslo Fabian Stang. Axel Heiberg Stang was a Norwegian landowner and forester. Stang first joined the Nasjonal Samling in 1933 and served as district leader in Glåmdal, although he was largely a minor figure before World War II. 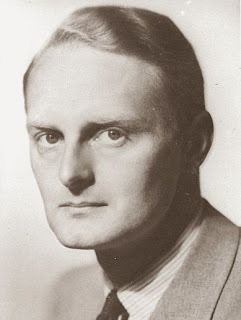 After the invasion of Norway in April 1940 he served as councillor of state in the Nasjonal Samling government of Vidkun Quisling, and later as minister. He was put in joint charge of the NS political staff with Ragnar Skancke. The Germans thought it wise to include him due to his family's close ties to the Royal Court and recommended that he be a part of the new government despite his lack of experience and commitment. In September he was appointed to Vidkun Quisling's collaborationist government as Minister of Labour and Sports, a heavily ideological department. In this role he passed a law in 1941 making service compulsory in the Arbeidstjenesten, an organisation modelled on the German Reichsarbeitsdienst,. He also made service compulsory for all children in the "NSUF”, this organisation was closely modelled on the Hitlerjugend. This proved a disaster as it infuriated the population and was later scrapped altogether. Also his attempts to force all sports club to join the Nasjonal Samling Sports Organisation proved a failure, leading to an almost total boycott of organised sport for the duration of the occupation. Whilst continuing as a minister he also enrolled in the SS Division Nordland and won the German Iron Cross Second Class after seeing action in the Balkans. He also served, during the summer of 1941, for 8 weeks on the Eastern Front in Finland. He was generally considered to be moderate and amicable among contemporaries, but unable to resist neither his German advisors nor the Norwegian hardliners in the government. After the war, he was sentenced to life in prison in 1946, for his involvement in collaboration, which was subsequently commuted to 20 years of hard labour. At his appeal to the Supreme Court, a minority of 3 judges voted for the death penalty, among them his own cousin, Emil Stang. He received a full pardon in 1956 and retired to his estate at Rømskog, where he remained until his death.